Capability is the backbone of an organization. The lack of organizational capability can lead to cost overruns, missed or close deadlines, poor morale, quality problems, customer complaints, and the inability to repeat previous success. But while organizational leaders recognize the need for capability improvement-according to a McKinsey & Company survey, executives view capability building as a top three strategic priority they often don't know how to address their need. These models provide a framework for developing, improving and sustaining business performance in your environment. They enable you to determine if your current way of doing things is working, if you're improving, and they lead you toward greater continuous improvement. A key component to capability improvement is CMMI's maturity levels. Maturity levels provide a rigorous benchmark rating method that enables you to compare your organization's capability to its competitors, its industry and itself over time. CMMI provides 5 maturity levels that demonstrate a visible path for improvement: Initial, Managed, Defined, Quantitatively Managed and Optimizing. As an organization advances its capabilities, it can expect to achieve a higher maturity level by identifying areas of improvement, working to correct these areas and integrating these solutions across its organization. High-maturity organizations have both lower risk and increased quality. 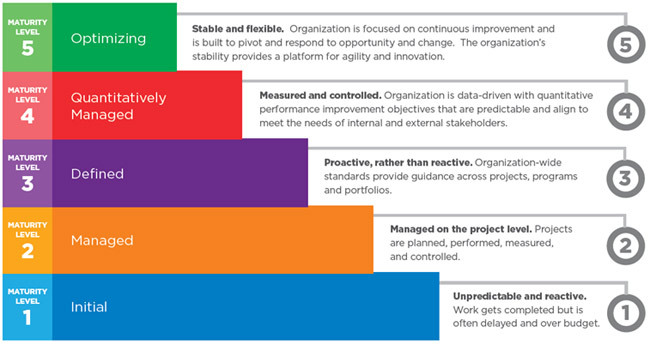 The higher the organization's maturity, the better its performance. By achieving a high CMMI maturity level, an organization demonstrates a deeper commitment to improving capabilities using statistical and other quantitative methods. A focus on continuous improvement means that high-maturity organizations are constantly evolving, adapting and growing to meet the needs of stakeholders and customers. Source: ISACA News. Written by Sheela Nath, Business Writer, CMMI Institute.